With all the new development occurring in and around Orland Park, I thought it was a good idea to check on our beginnings. While traveling through the older section of Orland, you may notice a large “House on the Hill” at 9830 W. 144th Place. This is the Humphrey House, which was occupied by the Humphrey family from its construction in 1881 until 1987. Fully intending to get “just” a tour of the building, I met with Bob and Violet Elli, two very involved members of the Orland Historical Society. They enthusiastically present the tour and tell stories of the house and the family who lived there for more than 100 years. Born in 1838, John Humphrey traveled from England with his mother and stepfather at the ripe old age of 10. He later became the Orland Park village president (mayor) and a state senator. He called this farming village home, although he also maintained an office in downtown Chicago and frequented Springfield to carry out his senatorial duties. While touring the home, it seemed as if each room told a story. The kitchen and pantry were filled with antiques and crocheted pieces, where one could envision a woman of the day putting up cans and storing for the winter. The dining room was set as if for visitors, displaying some of the wonderful dishware and pieces gleaned from the attic. One piece in particular was completely foreign to me; it was an antique pickle jar. The “sitting room” was a step back in time. Smaller-scaled furniture, artwork and an operating antique record player adorned the stately room. The music that came from the machine was rich, full and melodic. This was Sen. Humphrey’s waiting room for visitors to his home office. Stepping into Sen. Humphrey’s office, one could only imagine the business that was conducted at a time when the area was new. This house was built on 12 acres, and was only the second in the area, which, because of the train route, became a booming destination. Volumes of books, scrapbooks, newspaper clippings and journals detail the business of the day. Maps on the wall show the development of the proposed railroad system for the area. Heading up the stairs, we next toured the bedrooms. A child’s room, replete with a high chair, rocking horse, toys and clothing placed upon the bed transported one back to a simpler time. At this point in the tour, stories of paranormal activity and other “happenings” in the house were traded. Of the seven children Humphrey had with his first wife, Amelia Patrick, four died early in life. Libby, their first child, was buried at Bachelor’s Grove Cemetery, and Amelia, her mother, is at the Orland Park Cemetery. Folklore states that Amelia sometimes leaves the family plot in Orland and visits the grave of her Libby, rocking her to sleep. Sen. Humphrey remarried after Amelia’s death. He and Ida Stuart had John Stuart Humphrey, who lived in the home until he died in 1987. At that time, he willed the family home, furnishings and property to the Orland Historical Society. Two other bedrooms housed the dapper clothing and accoutrements of people of privilege, although in this (then) farming community, Sen. Humphrey wanted to align with his constituents. Although they employed a girl who helped the family cook, clean and perform other household chores, they never regarded her as a servant, so as to appear as one of the many he represented. Heading back down to visit with Violet and Bob in the kitchen, one could view the family tree and learn about Civil War history and the 59 local residents who were part of that conflict. At that time, another couple came to visit the house. She, a former Orland Parker, was excited to learn about the history, and was in for quite a tour. 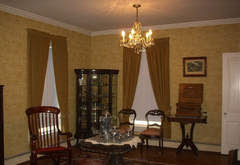 The Humphrey House, or House on the Hill, is available for tours from 2 to 4 p.m. the second Sunday each month.